Belousov A, Belousova M, Zaw K, Streck MJ, BindemanI, Meffre S, Vasconcelos P.(2018).Holocene eruptions of Mt. Popa, Myanmar: Volcanological evidence of the ongoing subduction of Indian Plate along Arakan Trench. Journal of Volcanology and Geothermal Research 360, 126-138. Full text in PDF. Auer A, Belousov A, Belousova M. (2018). 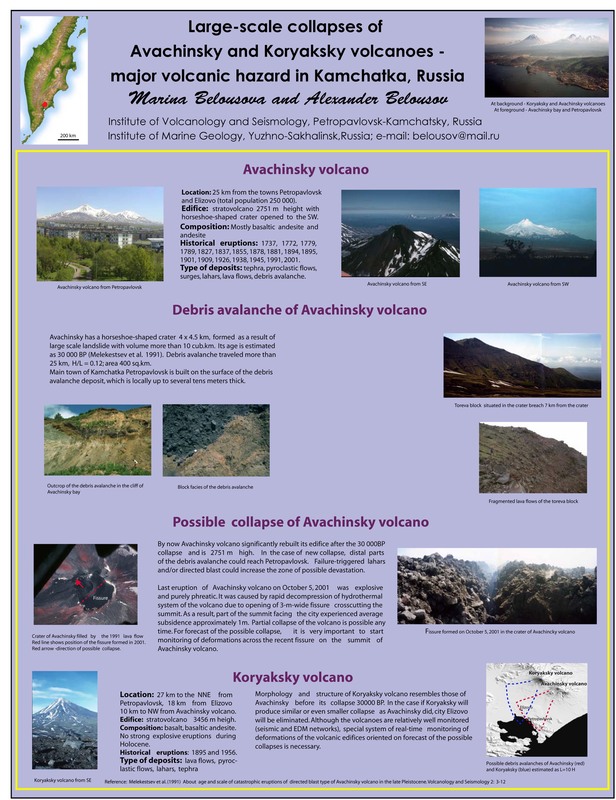 Deposits, petrology and mechanism of the 2010–2013 eruption of Kizimen volcano in Kamchatka, Russia. Bulletin of Volcanology 80:33. Full text in PDF. Krippner J, Belousov A, Belousova M, Ramsey M. (2018). Parametric analysis of lava dome-collapse events and pyroclastic deposits at Shiveluch volcano, Kamchatka, using visible and infrared satellite data. Journal of Volcanology and Geothermal Research 354:115-129. Full text in PDF. Gurenko A., Belousov A., Kamenetsky V., Zelenski M. (2018) Origin of volatiles emitted by Plinian basaltic eruptions of Chikurachki volcano, Kurile arc, Russia: trace element, boron and sulphur isotope constraints. Chemical Geology 478:131-147.Full text in PDF. Belousov A., Belousova M. (2018) Dynamics and viscosity of 'a'a and pahoehoe lava flows of the 2012-13 eruption of Tolbachik volcano, Kamchatka, Russia. Bulletin of Volcanology 80:6. Full text in PDF. Falvard S., Paris R., Belousova M., Belousov A., Giachetti T.,Cuven S. (2018) Scenario of the 1996 volcanic tsunamis in Karymskoye Lake, Kamchatka, inferred from X-ray tomography of heavy minerals in tsunami deposits. Marine Geology 396:160-170. Full text in PDF. Harris A.J.L., Belousov A., Delgado-Granados H., Hort M. et al. (2017) Translations of volcanological terms: cross-cultural standards for teaching, communication, and reporting. Bulletin of Volcanology 79 (7): 57. Full text in PDF. Belousov A., Belousova M., Kozlov D. (2017) The distribution of tephra deposits and reconstructing the parameters of 1973 eruption on Tyatya volcano, Kunashir, Kurile Islands. 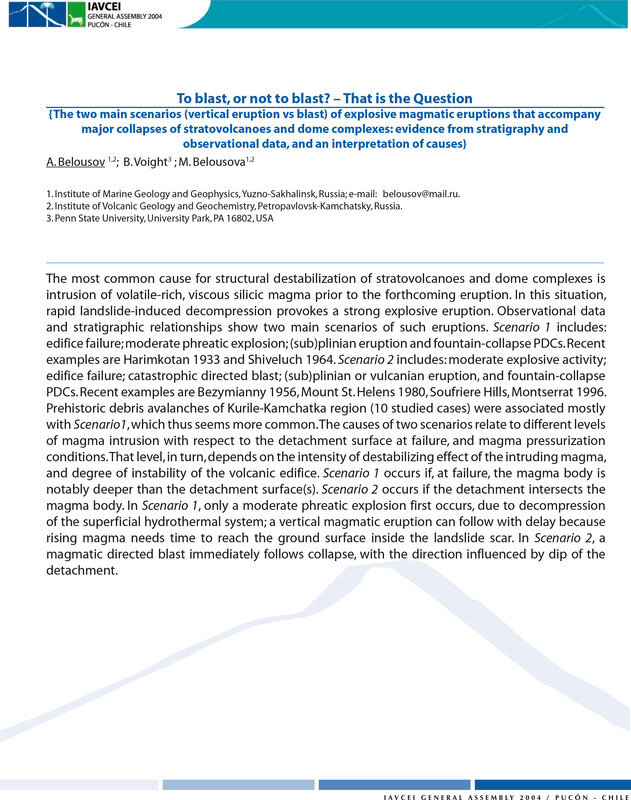 Journal of Volcanology and Seismology 11(4): 285-294. Full text in PDF. Edwards B., Belousov A., Belousova M., Volynets A. (2015). Introduction to the 2012–2013 Tolbachik eruption special issue. Journal of Volcanology and Geothermal Research 307: 1-2. Full text in PDF. Belousov A., Belousova M., Edwards B., Volynets A., & Melnikov D. (2015). Overview of the precursors and dynamics of the 2012–13 basaltic fissure eruption of Tolbachik Volcano, Kamchatka, Russia. Journal of Volcanology and Geothermal Research 307: 22-37. Full text in PDF. 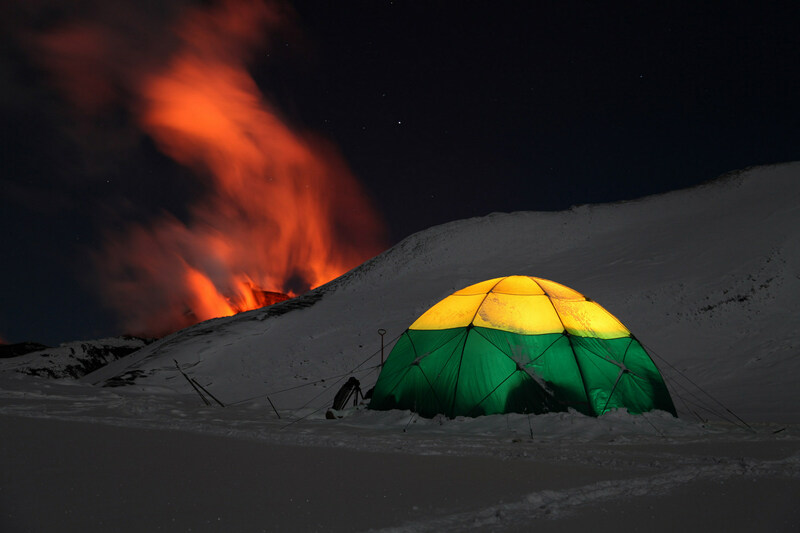 Edwards B., Belousov A., Belousova M., Melnikov D. (2015) Observations on lava, snowpack and their interactions during the 2012–13 Tolbachik eruption, Klyuchevskoy Group, Kamchatka, Russia. Journal of Volcanology and Geothermal Research 307: 107-119. Full text in PDF. Belousov A., Belousova M., Krimer D., Costa F., Prambada O., Zaennudin A. (2015) Volcaniclastic stratigraphy of Gede Volcano, West Java, Indonesia: How it erupted and when. Journal of Volcanology and Geothermal Research, 301: 238-252.Full text in PDF. Zellmer G. F., Rubin K. H., Miller C. A., Shellnutt J. G., Belousov, A., & Belousova M. (2015). Resolving discordant U–Th–Ra ages: constraints on petrogenetic processes of recent effusive eruptions at Tatun Volcano Group, northern Taiwan. Geological Society, London, Special Publications 422: SP422-3. Full text in PDF. Clarke A, Ongaro T.E., Belousov A. (2015). The encyclopedia of volcanoes. Elsevier.Vulcanian explosions. In: Sigurdsson, H. et al. (Eds. )The encyclopedia of volcanoes. Elsevier, pp. 505-518. Full text in PDF. Edwards B, Belousov A., Belousova M. (2014) Propagation style controls lava-snow interactions. Nature Communications, 5666: 1-5. DOI: 10.1038/ncomms6666. Full text in PDF. Voight B, Sparks R.S.J., Shalev E., Belousov A. (2014) The SEA-CALIPSO volcano imaging experiment at Montserrat: plans, campaigns at sea and on land, scientific results, and lessons learned. Geological Society, London, Memoirs, 39: 253-289, doi:10.1144/M39.15. Shellnutt J., Belousov A., Belousova, M, Wang, K.-L, Zellmer G. (2014) Generation of calc-alkaline andesite rocks of the Tatun volcanic group (Taiwan) within an extensional environment by crystal fractionation. International Geology Review, 56/9: 1156-1171. Full text in PDF. Belousov A.B. , Belousova M.G., Murav'ev Y.D. 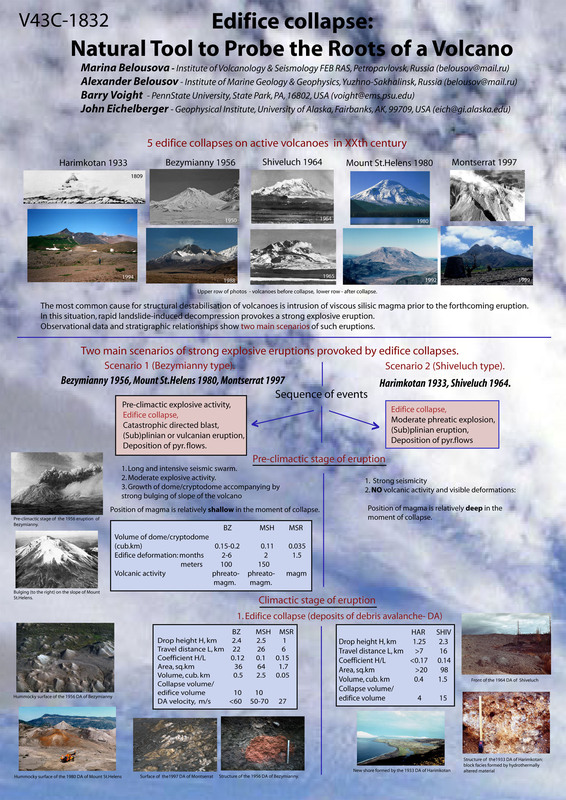 (1997) Holocene eruptions in the Akademiya Nauk caldera and the age of the Karymsky stratovolcano, Kamchatka. Transactions of the Russian Academy of Sciences, Earth Science Sections 335, n.5: 653-657. Belousov A.B., Belousova M.G. (1996) The 1964 eruption of Shiveluch (Kamchatka) - a plinian eruption preceded by a voluminous slide of the cone top. Volcanology and Seismology 17: 497-508 (in Russian). Diaries of volcanologist Boris Piip. (2006) Moscow - Petropavlovsk-Kamchatsky.LOGATA. 160 pp. (in Russian). Mania R, Salzer J, Walter T, Belousova M, Belousov A, Chirkov S, Senyukov S.(2018) Dome growth and eruptive events (2016-08/2017) at Bezymianny volcano, Kamchatka, measured by high resolution TerraSAR-X and photogrammetric data.EGU General Assembly Conference Abstracts. 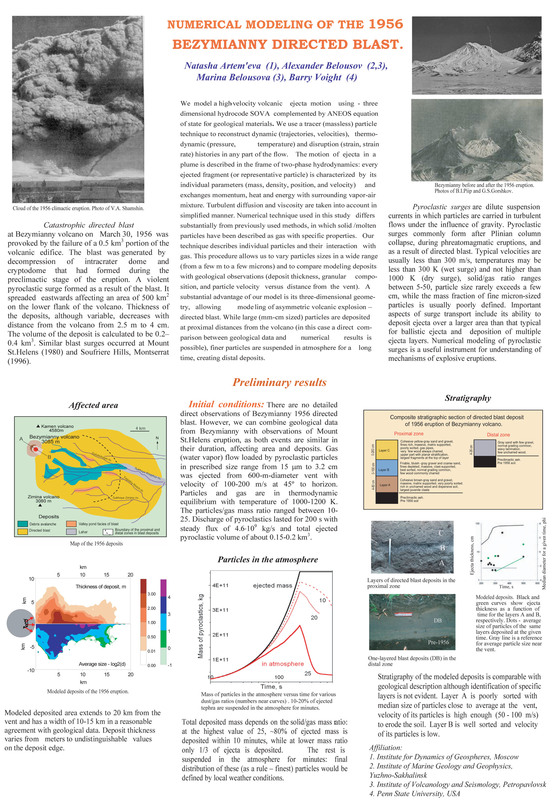 Auer A, Belousov A, Belousova M. (2018) Effects of pre-eruptive long-term passive degassing on the dynamics of 2010 - 2013 eruption of Kizimen Volcano in Kamchatka, Russia. Cities on Volcanoes, Napoli, Italy. Belousov A., Belousova M, Edwards B. (2017) Dynamics and functional model of the 2012–13 flank fissure eruption of Tolbachik volcano in Kamchatka, Russia. EGU General Assembly Conference Abstracts 19, 6881 Text of abstact. Belousov A., Belousova M, Kozlov D. (2017) Strong hydrothermal eruption 600 BP inside Golovnin caldera, Kunashir Island, Kurile arc. EGU General Assembly Conference Abstracts 19, 7596 Text of abstact. Krippner, J,Belousov A ,Belousova M., Ramsey, M. (2017) Correlating dome collapse events with block and ash flow deposits at Shiveluch volcano, Kamchatka. IAVCEI 2017 Scientific Assembly, Portland, 552. Text of abstact. Krippner J.,Belousov A. and Belousova M. Combining satellite, aerial, and field data to distinguish pyroclastic flow vs. block and ash flow deposits at Mount St. Helens and Shiveluch volcanoes. "Cities on Volcanoes" conference, Puerto Varas, Chile Text of abstact. Belousov A., Belousova M., Kozlov D. Distribution of tephra deposits and reconstruction of parameters of the 1973 basaltic explosive eruption of Tyatya volcano, Kunashir Island, Kurile Arc. "Cities on Volcanoes" conference, Puerto Varas, Chile Text of abstact. Poster. Belousov A., Belousova M., Edwards B., Volynetz A., Melnikov D., Dvigalo V., and Senyukov S. Overview of the 2012-13 basaltic fissure eruption of Tolbachik, Kamchatka, Russia.EGU meeting.Text of abstact. Volynets A., Melnikov D, Belousov A., Belousova M, and Yakushev A. Geochemistry of the 2012-2013 Tolbachik Fissure eruption (Kamchatka, Russia). EGU meeting.Text of abstract. Edwards B., Belousov A., and Belousova M. Controls on lava-snow interactions from propogation styles during the 2012-13 Tolbachik eruption.EGU meeting.Text of abstract. Melnikov D., Harris A., Volynets A., Belousov A., and Belousova M. Dynamic of the lava flows during the Tolbachik Fissure eruption in 2012-2013 (Kamchatka) inferred from the satellite and ground-based observations. EGU meeting. Belousova M., Belousov A., Patia H., and Hoblitt R. The 1951 eruption of Mt. 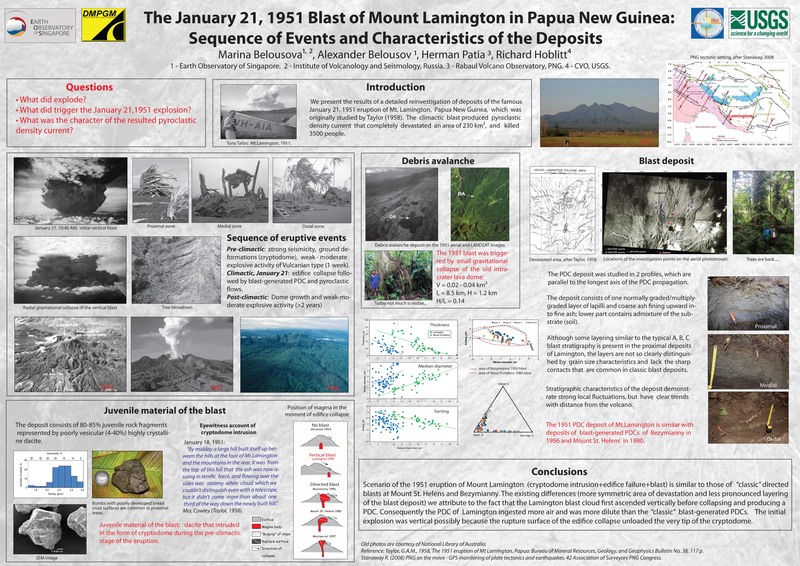 Lamington, Papua New Guinea: directed blast directed upward. GSA meeting. Belousov A.; Belousova M., Edwards B., Volynetz A., Melnikov D., Senyukov S. New cubic-kilometer-scale basaltic fissure eruption of Tolbachik, Kamchatka, Russia. GSA meeting. Edwards B.; Belousov A.; Belousova M.; Izbekov P.; Bindeman I; Gordeev E.; Muravyev Ya. ; Melnikov D. Lava-snow interactions at Tolbachik 2012-13 eruption: comparison to recent field observations and experiments. AGU Fall Meeting. Belousov A, Belousova M, Zaennudin A, Prambada O. 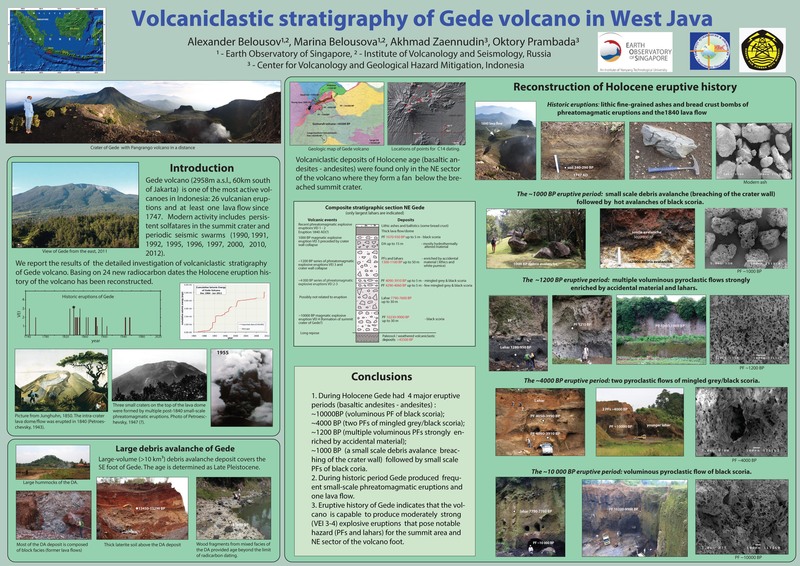 (2012) How and when erupted Gede volcano in West Java: the story told by volcaniclastic stratigraphy. Eos Trans. AGU, 93(52), Fall Meet. Suppl.Text of abstract. Poster. 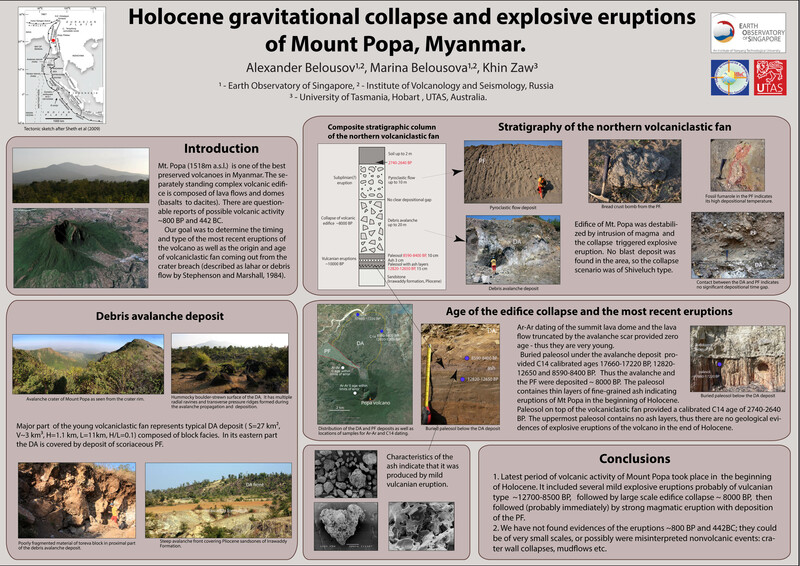 Belousova M, Belousov A, Khin Zaw (2012) Holocene gravitational collapse and explosive eruption of Mount Popa, Myanmar. Eos Trans. AGU, 93(52), Fall Meet. Suppl.Text of abstract. Poster. Neill OK, Hammer JE, Izbekov PE, Belousova M, Belousov A, Clarke AB, Foroozan R (2010) Pre-eruptive crystallization and degassing processes associated with laterally directed volcanic explosions, V21B-2323. Eos Trans. AGU, 91(52), Fall Meet. Suppl. Kayzar T., Nelson B., Reagan M., Izbekov P., Belousova M., Belousov A. (2010) Periodically erupting degassed magma: The evolution of Karymsky, Bezymianny, and Shiveluch volcanic systems in the past decade. Cities on Volcanoes-6, Tenerife. Torsvik T., Paris R., Didenkulova I., Pelinovsky E., Belousov A., Belousova M. (2010) Numerical simulation of explosive tsunami wave generation and propagation in Karymskoye lake, Kamchatka, Russia. EGU General Assembly 2010, Geophysical Research Abstracts Vol. 12, EGU2010-2456. Kayzar T. M.; Nelson B. K.; Reagan M. K.; Izbekov P.; Belousova M. (2009) A Multi-Component Geochemical Study of Short-Term Melt and Volatile Evolution in the Kamchatka Volcanic Arc. Eos Trans. AGU, 90(52), Fall Meet. Suppl. 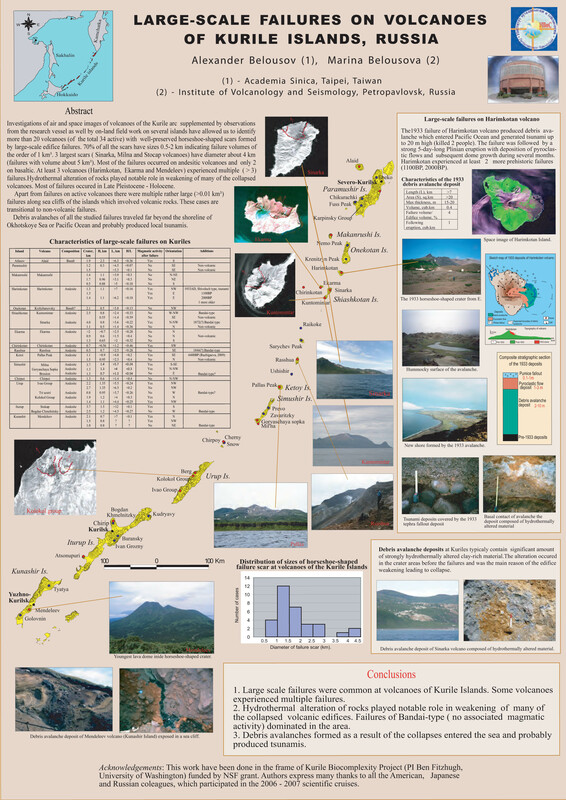 Chen C.-H, Belousov A., Belousova M. (2009) Volcanic activities of Tatun Volcanic Group in last 20 kyr, Northern Taiwan. Geological Society of America Annual Meeting, October 2009. Portland, USA. Belousova M., Belousov A., Chen C.-H. (2009) Large-scale edifice failures in the recent history of Tatun volcanic group, Northern Taiwan. 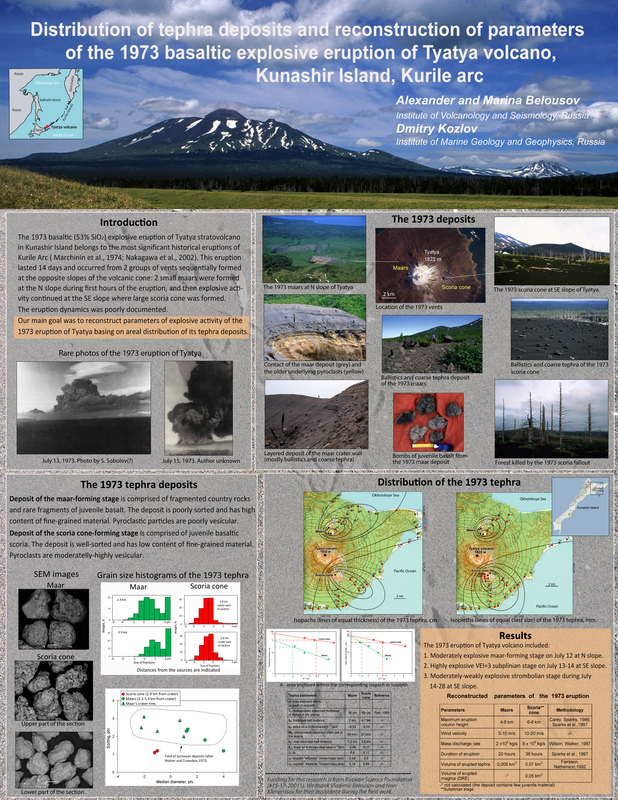 6th Biennial Workshop on Subduction Processes emphasizing the Japan-Kurile-Kamchatka-Aleutian Arcs (JKASP-6). Fairbanks, Alaska. Belousov A., Belousova M., Chen C.-H. (2009) Eruptions in the recent history of the Tatun volcanic group, Northern Taiwan. JKASP-6, Alaska. Kayzar T. M.; Nelson B. K.; Izbekov P.; Belousova M., Belousov A. 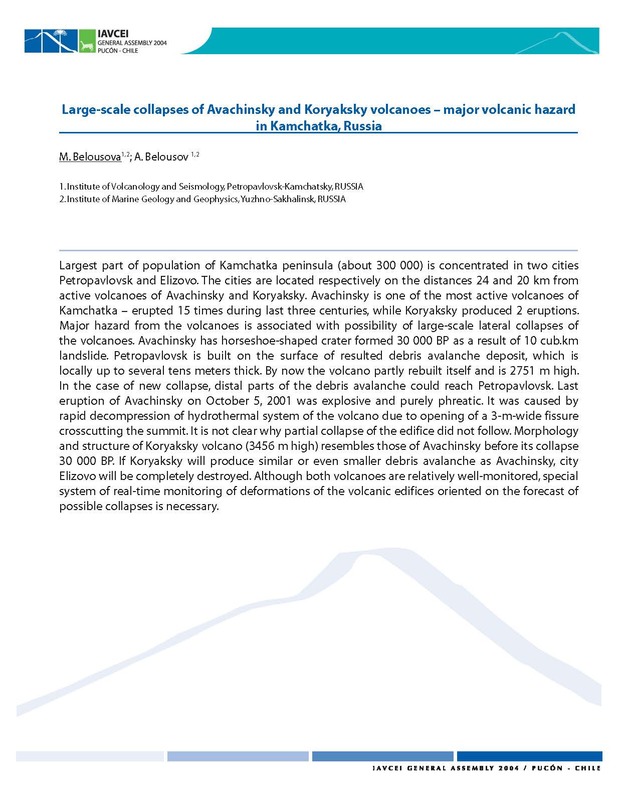 (2009) Volatiles in the Kamchatka volcanic arc at four volcanic centers (Bezymianny, Klyuchevskoy, Karymsky, and Shiveluch): applications for uranium-series isotopic data. JKASP-6, Alaska. Kayzar T. M.; Nelson B. K.; Izbekov P.; Belousova M., Belousov A. and PIRE team. (2009) Geochemical tracing of volcanic gases at Bezymianny and Shiveluch volcano: implications for magmatic plumbing sources. JKASP-6, Alaska. Neill O., Hammer J., Izbekov P., Belousova M., Belousov A., Clarke A., Voight B. (2009) Edifice Pressure Prior to the 30 March, 1956 Eruption of Bezymianny Volcano, Kamchatka, Russia. JKASP-6, Alaska. Belousov A., Belousova M., Clarke A., Voight B, Genereau K.(2009) Evolution of deposit characteristics of blast-generated pyroclastic density current with distance from volcano: key to transportation/deposition mechanisms of the Bezymianny, 1956 and Mount St. Helens, 1980 events. JKASP-6, Alaska. Carter A, Ramsey M, Girina O, Belousov A. 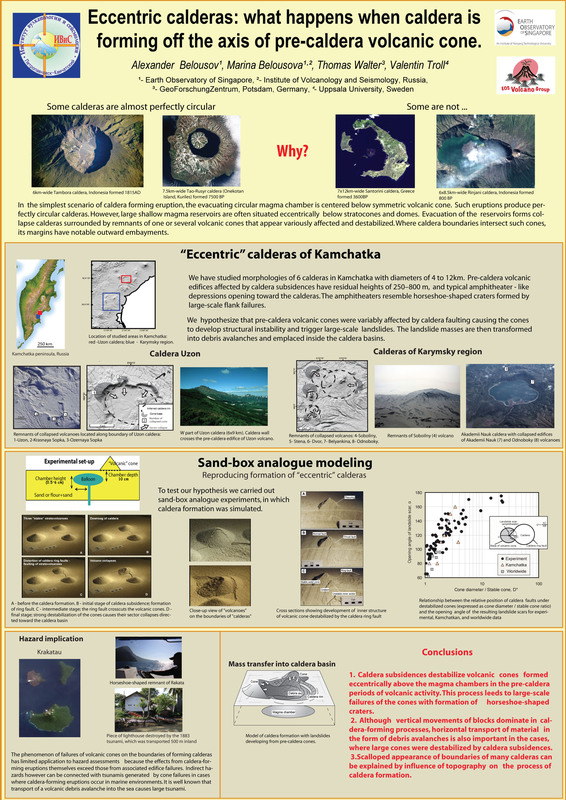 (2008) Spaceborne and field-based observations of Bezymianny Volcano, Kamchatka from 2000-2008. Eos Trans. AGU, 89(52), Fall Meet. Suppl. Kayzar T, Melson B, Izbekov P, Belousova M. (2008)Fine-Scale Source Variations in Time-Series Samples From Kamchatkan Volcanoes Recorded in High-Precision Pb Isotope Ratios. Eos Trans. AGU, 89(52), Fall Meet. Suppl. Belousova M., Belousov A. (2008) Mechanism of long runout of volcanic debris avalanches: what we can learn from basal contacts of their deposits. IAVCEI General Assembly, Reykjavik, Iceland. 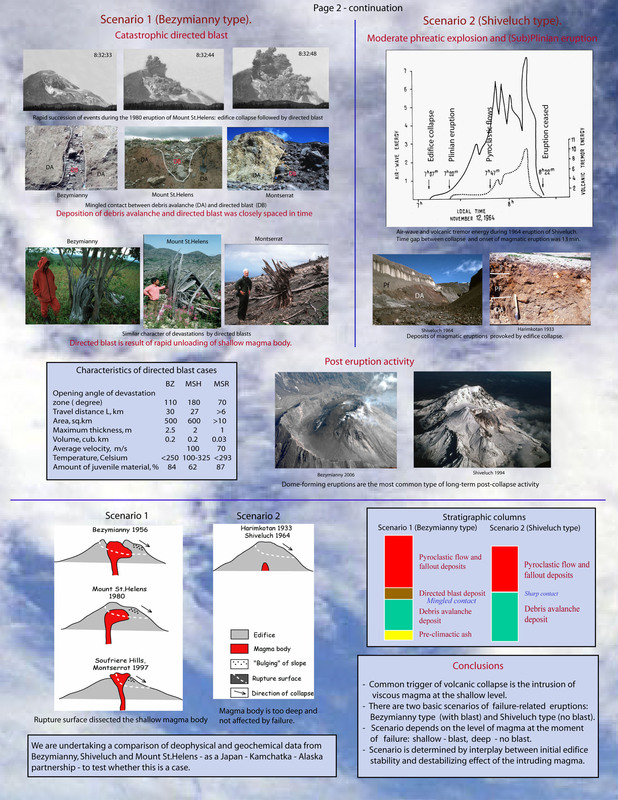 Dufresne A, Siebert L, Bernard B, Sparks S, Takarada S, Clavero J, Belousov A., Belousova M. (2008) Volcanic Debris Avalanche Deposit Database, A Progress Report. IAVCEI General Assembly, Reykjavik, Iceland. Voight B, Johnson M, Zamora W, Herd R, Malin PE, Ammon, C, Elsworth D, Saldana S, Paulatto M, De Angelis S, Byerly K, Kiddle E, Bass V, Belousov A et al. (2008) The SEA-CALIPSO volcano imaging experiment on Montserrat: Part 1. Onshore seismometer deployments, tomography, and images from onshore stations. IAVCEI General Assembly, Reykjavik, Iceland. Belousov A., Voight B., Belousova M. (2006) The 1956 eruption of Bezymianny and similar events worldwide: eruptive sequences, deposits and mechanisms. pp.43-48. Proceedings of International Workshop: 50-th anniversary of the 1956 Bezymianny eruption, Petropavlovsk, Russia. E.I. Gordeev editor. Text of abstract. Artemieva N., Belousov A., Voight B., Belousova M. (2006) Numerical modeling of the 1956 Bezymianny directed blast. pp.58-61. Proceedings of International Workshop: 50-th anniversary of the 1956 Bezymianny eruption, Petropavlovsk, Russia. E.I. Gordeev editor. Text of abstract / Poster. Belousova M., Belousov A., Voight B., Eichelberger J. (2006) Edifice Collapse: Natural Tool to Probe the Roots of a Volcano. 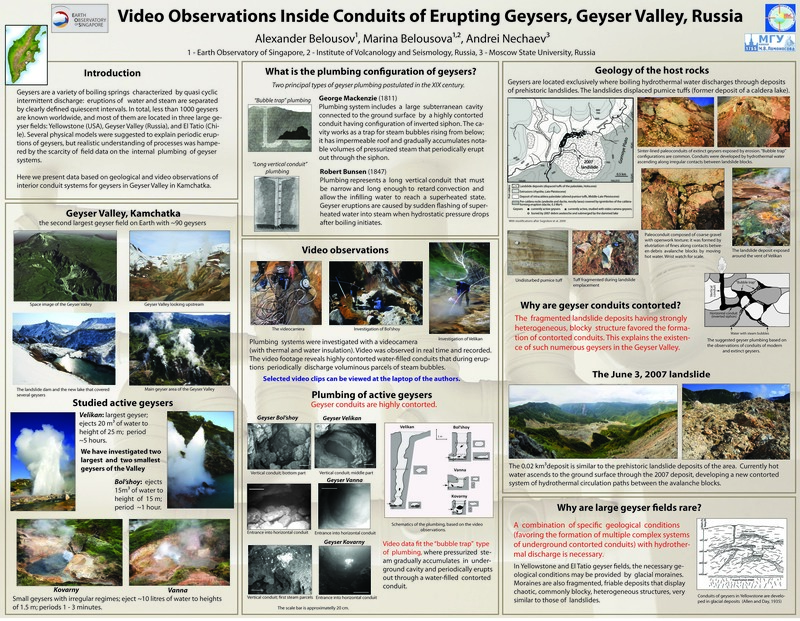 AGU Fall Meeting, San Francisco,USA Poster, part 1 / Poster, part 2. Belousov A., Voight B, Belousova M., Eichelberger J. (2006) Edifice collapse: mechanisms, deposits, and consequences. 5th biennial Workshop on subduction processes emphasizing the Kurile-Kamchatkan-Aleutian Arcs (JKASP-5), Sapporo, Japan. Belousov A., Belousova M. (2004) Direct sampling of eruptive clouds using tethered balloons: results of the 2003 and 2004 field experiments on Karymsky volcano, Kamchatka, Russia. 4th biennial Workshop on subduction processes emphasizing the Kurile-Kamchatkan-Aleutian Arcs (JKASP-4), Petropavlovsk: 23. Power Point. Belousov A., Belousova M. (2004) Maars of Kamchatka (Russian Far East): the first data. 2nd Maar conference, Hungary: 42. Power Point. Belousov A., Voight B, Belousova M. (2004) To blast, or not to blast? That is the Question. IAVCEI General Assembly, Chile. Abstract /Power Point. Belousov A., Walter T., Troll V. (2004) Destabilization and failure of volcanic cones provoked by caldera subsidences. IAVCEI General Assembly, Chile. Poster. Piip V.B. and Belousov A.B. (2003) 2D-interpretation of data of shallow refraction seismic: structure of the 1912 ash flow, Alaska. EAGE 65-th conference, Stavanger, Norway. Text of abstract. 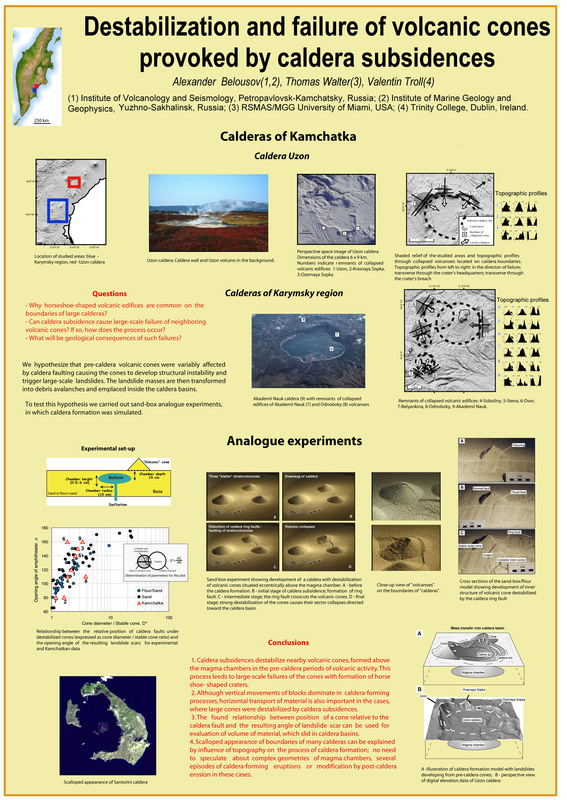 Belousov A.B., Walter T., Troll V. (2003) Large-scale failures on domes and stratocones situated on caldera ring faults: sand box modeling and natural examples from Kamchatka, Russia. XXIII IUGG General Assembly, Sapporo, Japan A.524. Power Point. Belousov A.B., Belousova M.G. (2003) Cities Petropavlovsk and Elizovo under threat of large-scale collapses of Avachinsky and Koryaksky volcanoes, Kamchatka, Russia. conference: Cities on Volcanoes. Hilo, Hawaii. Gurenko, A.A., Belousov, A.B., Sobolev, A.V. (2003) Petrology and geochemistry of plinian basaltic volcanism of Chikurachki volcano, Kurile Islands, Russia. EGS - AGU - EUG Joint Assembly, Nice, France. Komorowski, J-C, Voight, B, Norton, G E, Belousov, A B, Belousova, M G, Boudon, G, Francis, P W, Franz, W, Heinrich, P, Sparks, R S J, Young, S R. (2002) The 26 December (Boxing Day) 1997 sector collapse and debris avalanche at Soufriere Hills Volcano, Montserrat. Conference: Mount Pelee 1902-2002, Martinique: 69. Belousov A., Belousova M. (2002) Chikurachki volcano (Kurile islands, Russia): the unique volcano with frequent basaltic plinian eruptions. 3rd biennial Workshop on subduction processes emphasizing the Kurile-Kamchatkan-Aleutian Arcs, Fairbanks, Alaska. Power Point. Belousov A , Belousova M. (2002) The 1996 surtseyan type eruption in Karymskoye intracaldera lake, Kamchatka, Russia. Chapman conference on explosive subaqueous volcanism, Dunedin, New Zealand. Belousova M., Belousov A. 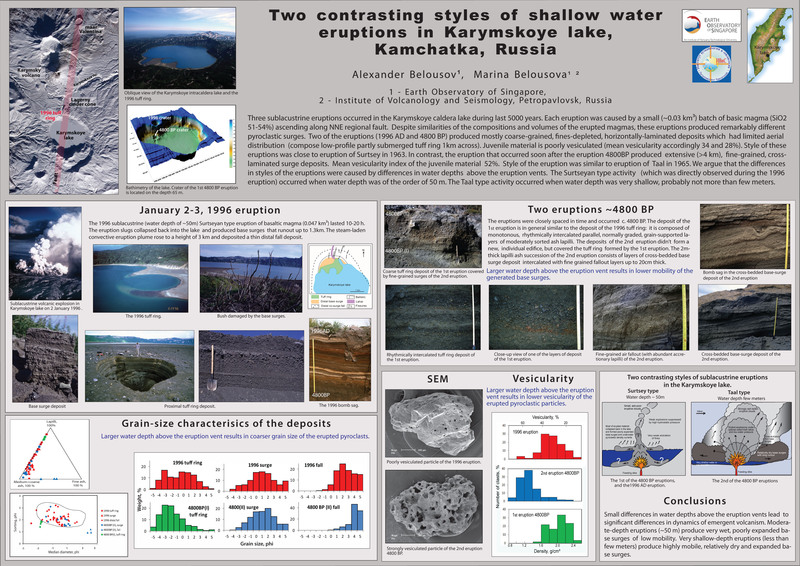 (2002) Styles and deposits of shallow-water eruptions in Karymskoye intracaldera lake, Kamchatka, Russia. Chapman conference on explosive subaqueous volcanism, Dunedin, New Zealand. Churikova T, Ivanov B, Eichelberger J, Trusov S, Gardner J, Belousov A, Browne B, Izbekov P, Werner G. (2001) Kizimen Volcano: An Unzen-like Magma System in Kamchatka. Eos Trans. AGU 82 (47), Fall Meet.Suppl., Abstract V42D-1062. Belousov A., Belousova M. (1999) Tsunamis by volcanic explosions: deposits and runup data from the 1996 eruption In Karymskoye Lake, Kamchatka, Russia. IUGG XXII, Birmingham. Belousov A., Belousova M. (1999) Eruptive process, effects and deposits of the 1996 and ancient basaltic phreatomagmatic eruptions in Karymskoye Lake, Kamchatka, Russia. IUGG XXII, Birmingham. Belousova M., Belousov A. (1999) Powerful pyroclastic surge at Bezymianny volcano on May 9-10, 1997, Kamchatka, Russia. IUGG XXII, Birmingham. Belousov A.B. (1996) Block and Ash Pyroclastic Flows of Basaltic Composition Generated by Secondary Phreatomagmatic Explosions on Lava Flows - New Type of Volcanic Hazard Demonsrated by 1994 Eruption of Kluchevskoy Volcano, Kamchatka). Pan Pacific Hazard Conference, Vancouver: 29. Belousov A. (1994) Generation of destructive lahars as a result of surge-snow interaction during 1993 eruption of Shiveluch volcano (Kamchatka). 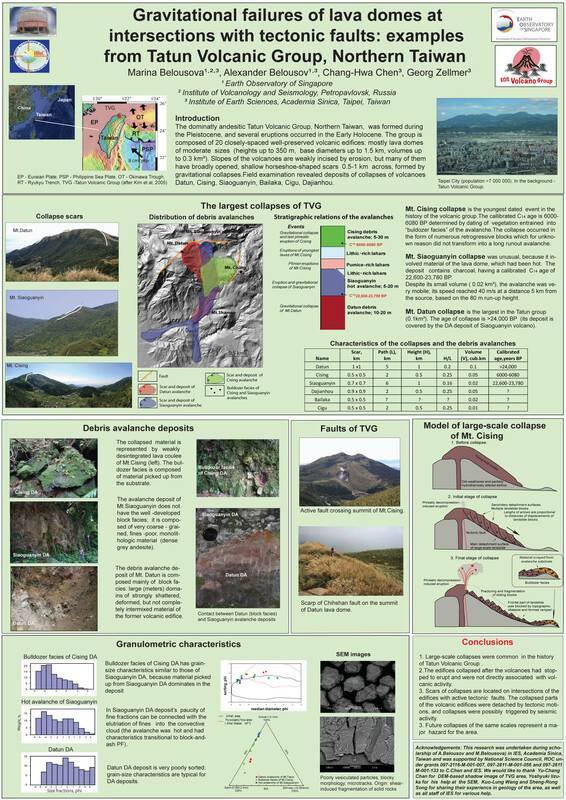 IVth International Conference at Colima volcano, Mexico: 62. Belousov A. (1992) The 12 November eruption of Sheveluch volcano in 1964 - an explosive eruption with collapse of the volcanic edifice. 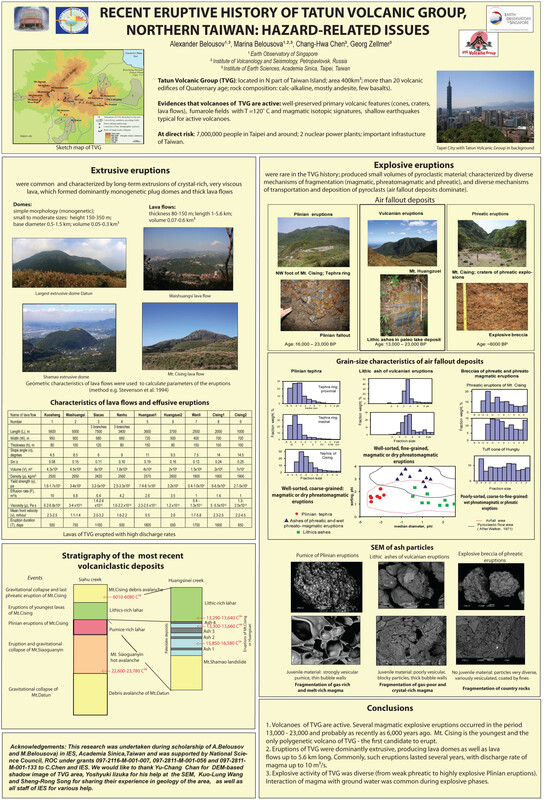 29th International Geological Congress, Kyoto: 503. Volcanoes. 2014 IAVCEI calendar. Published by "Brown Тrout", USA. Photo of 2013 Tolbachik eruption at night. Volcanoes. 2004 IAVCEI calendar. Published by "Brown Тrout", USA.Photo of Chikurachki volcano, Paramushir island, Kuriles in 2000. Nechayev A. (2013) Around the wild Kamchatka. Нечаев А. (2013) По дикой Камчатке.Photoalbum including photos made by A. Belousov et al. Logata, Moscow. 237 p.
Nechayev A. (2008). 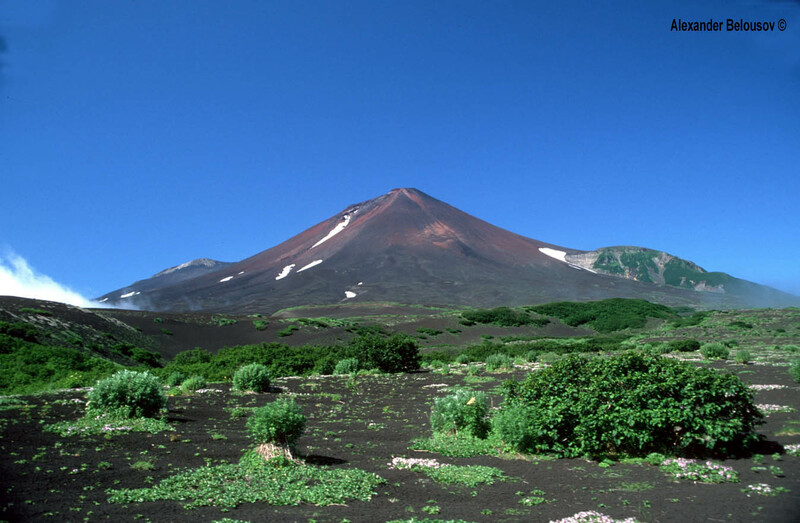 Kamchatka: the Kingdom of Volcanoes. Photoalbum including photos made by A. Belousov et al. Logata, Moscow. Nechayev A. (1999-1st edition, 2001-2nd edition) Miracles of Kamchatka land. Photoalbum including photos made by A. Belousov et al. Logata, Moscow, 159 pp. Nechayev A. (2000) Valley of Geysers. Photoalbum including photos made by A. Belousov et al. Logata, Moscow, 160 pp. Nechayev A. (2003) KAMCHATKA: hot land at the cold sea. Photoalbum including photos made by A. Belousov et al. Logata, Moscow, 158 pp.